HELSINKI — Sweden's defense command has responded to the growing unpredictability of a changed security landscape in the greater Baltic Sea area by toughening up the Military Strategy Doctrine (MSD) under which the Swedish Armed Forces (SAF) deals with threats against the country's sovereignty. The new doctrine shifts the emphasis of national defense from a post-Cold War era strategy largely based on containment to a more aggressive model that will deploy advanced weapons systems and modern warfare forces as part of a "sustained" and coordinated high-impact strike against attackers. The revised MSD formats a framework under which the defense of Sweden can be conducted either "alone" or potentially in collaboration with multinational Nordic, European Union or NATO forces. Running doubts over Sweden's defense capability and preparedness were affirmed by the SAF's former supreme commander, Gen. Sverker Göranson, in January 2013. Göranson observed that capacity shrinkage and serial budget cuts had reduced the SAF's operating capability to such a skeletal level that Sweden's combined land, air and naval forces would be incapable of defending the country "in one place for more than a week" against a major hostile power. Göranson's remarks triggered a politically charged debate on national defense that culminated in a government commitment to scale up military spending and modernize fighter aircraft, artillery and naval capacities, while re-establishing a military presence on Gotland, Sweden's strategic island outpost in the Baltic Sea. "The depletion in the Armed Forces' capacity was substantial, and it could not continue. We now live in more unpredictable times. The old military doctrine was shaped after the last Cold War when Sweden believed that Russia was on the road to becoming a real democracy that would no longer pose a threat to this country and its neighbors," said Allan Widman, Parliamentary Defense Committee chairman and member of the Liberal party. Russia's annexation of Crimea, and its activities in Ukraine, serve as a warning to all states in the region concerning the indeterminate nature of the Kremlin's future actions and intentions, Widman said. The notable downsizing of Sweden’s military end strength manpower and capacity began in the wake of the fall of the Berlin Wall in November 1989. In subsequent years, lower spending on the then-conscription-based defense system substantially reduced fighter strength and manpower in core Army, Navy, Air Force, Home Guards and local defense units. The SAF's mobilization capacity comprised around 100,000 active-duty soldiers in 1985, supported by a further 350,000 trained reserves. Sweden's front-line response arsenal included 300 modern combat aircraft; a Navy operating a fleet of 40 warships and 12 submarines; and an extensive battalion-based coastal artillery system..
Post 1985, the SAF has lost over 50 percent of its operational Army combat units, 75 percent of its local defense divisions, over 60 percent of its aircraft and around 30 percent of its naval capacity, including surface ships and submarines. According to supreme commander Gen. Micael Bydén, the new MSD reflects a resolute "must win" mentality and the SAF's determination to aggressively defend Sweden against an invading force "to the last soldier" is necessary. "If for some reason we need to stand alone as a country, I promise that the Armed Forces will do all we can down to the last man or woman standing with arms in hand," Bydén said. Sweden's government and military maintain the official view that Russia does not pose an immediate direct threat, despite the Kremlin's unpredictability regionally and the increased activity of Russia's modernizing armed forces in the High North and Baltic Sea areas. "We may not have a direct threat to our national security, but we do need to prepare and plan for the future," said parliamentary defense committee member Hans Wallmark. The Moderate party to which Wallmark belongs advocates a long-term defense-building plan that includes higher spending on defense and Swedish membership of NATO. "We hold the belief that having Sweden in NATO would strengthen security in the Baltic region. Having Sweden outside the alliance just increases uncertainty. A Sweden in NATO would also give us more influence over the security issues that concern us, and a place at the table where the decisions that affect us are made. Sweden needs a road map for NATO membership," Wallmark said. 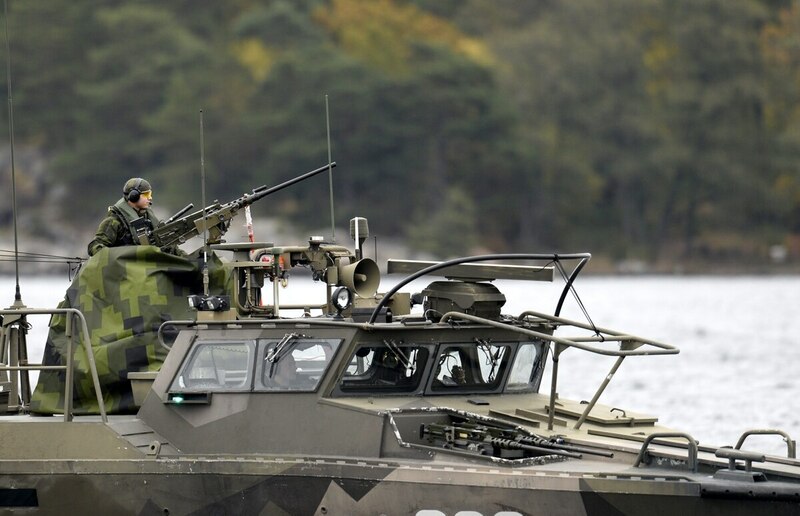 The Moderates also want Sweden to adopt a Total Defense strategy that would extend the SAF's mission-based mandate to bolstering air-defense and anti-submarine capabilities, as well as cyberwarfare counterstrike technologies and capacities. This envisaged Total Defense structure would run parallel to building closer bilateral and general defense cooperation agreements with Nordic Defense (NORDEFCO) partner nations, including nonaligned Finland and NATO-member states Norway, Denmark, Iceland, Estonia, Latvia and Lithuania. "This deeper form of Nordic defense cooperation will provide for a direct response to aggressive Russian behavior," Swedish Defence Minister Peter Hultqvist said. Sweden has also moved to strengthen military partnerships with NATO, the U.S. and the EU, as well as pursuing single interstate defense cooperation agreements with neighborhood states like Poland.